Whitworth junior Micah Spaun was selected from 1,123 top math, science and engineering students nominated by their institutions out of a pool of more than 300,000 students nationwide to receive a Barry M. Goldwater Scholarship for 2012-13. Spaun was among 282 Goldwater Scholars selected on the basis of academic achievement, research goals and experience, organizational contributions, and letters of recommendation, to receive one- and two-year scholarships of up to $7,500 per year. Spaun's one-year award will help pay tuition for his senior year at Whitworth. "The Goldwater Scholarship is an extremely prestigious award, and we are incredibly honored for Whitworth to have a history of Goldwater Scholars," says Susan Mabry, an associate professor of math & computer science at Whitworth who also serves as the university's Goldwater faculty representative. "Our record of scholars and honorable mentions says much about the caliber of our students and our science, math and engineering programs. We have worked very hard in recent years to establish quality undergraduate research programs in these disciplines and these awards are an affirmation of the quality of those programs and of our strong track record of students continuing on to graduate school." Spaun, an engineering physics major from Leavenworth, Wash., is the fourth Whitworth student in the last nine years to receive the award. His brother, Ben, '08, who now is pursuing a Ph.D. in atomic physics at Harvard University, won the scholarship in 2007. Of the 282 scholarships awarded this year, 10 went to students attending institutions in Washington state: three at the University of Puget Sound, two at the University of Washington, two at Washington State University, and one each at Central Washington University, Whitman College, and Whitworth. During summer 2011, Spaun began conducting research with Whitworth Associate Professor of Physics Kamesh Sankaran through a 10-week internship funded by NASA. He has continued that research this year. His work involves calculating optimum interplanetary trajectories to minimize fuel and trip time needed for a spacecraft propelled by low-thrust plasma propulsion systems to travel to asteroids. "Micah is an excellent student who takes ownership and initiative in learning," Sankaran says. "He also has demonstrated strength in working as a member of a team, which is essential to his success in scientific research." This summer, Spaun will work at the NASA Ames Research Center, in California, with the NASA Aeronautics Academy through the most competitive and highest paid internship that NASA offers. He will be working on the "Next Generation Air Transportation System Design" project, in which he will investigate building a prototype cockpit tool for general aviation pilots. "I believe my coursework at Whitworth has prepared me very well for a career within the engineering field, as it has provided me with the knowledge and analytical skills necessary for success," Spaun says. "I am greatly honored to receive the Goldwater Scholarship and will do my utmost to make good use of this blessing." At Whitworth, Spaun competes on the men's tennis team and serves as a physics tutor. After graduating, he plans to attend graduate school and earn a master's degree or Ph.D. in aerospace, aeronautical, or mechanical engineering. After completing graduate school he hopes to work in the aviation design/manufacturing industry as an engineering consultant or designer. He's also considering starting his own firm as a mechanical engineering consultant or designer. The Barry M. Goldwater Scholarship and Excellence in Education Program was established by Congress in honor of former Senator Barry M. Goldwater (R-Arizona). The program is designed to foster excellence and to encourage outstanding students to pursue careers in the fields of mathematics, the natural sciences and engineering. Students must undergo a competitive internal process before each university nominates their candidates for the award. In addition to Spaun, Whitworth's nominated candidates this year included juniors Brayden Hollis and Peter Landgren. Previous Whitworth students who have won the Goldwater Scholarship include Ben Spaun, '08, Ashley Gibbs, '07, and Caleb Hug, '04. 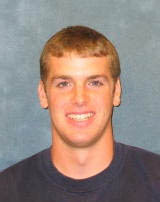 Whitworth senior Patrick Yoho received an honorable mention from the Goldwater program in 2011. Most Goldwater Scholars go on to doctoral programs, where they continue to receive prestigious scholarships and fellowships for their graduate study. Recent Goldwater Scholars have received 78 Rhodes Scholarships, 112 Marshall Awards, and numerous other distinguished fellowships and scholarships. Susan Mabry, associate professor of mathematics & computer science, Whitworth University, (509) 777-4686 or smabry@whitworth.edu.